Its that time again where I have to restock the pantry. A well stocked pantry is so important, with that you can make anything in a pinch. I always stock up on big bags of nuts, seeds, good quality canned items, maple syrup, organic honey and dry beans. I could go on forever about what should be in a well stocked pantry, that will be another post. Even at a store like Sam’s Club I can find some great products, this is where I finally found a larger bottle of good quality maple syrup. When I got home the maple syrup was calling my name. I knew it had to go into my dinner tonight. We don’t use refined sugar in this house, when I bake or cook the sweeteners I use are honey, maple syrup or stevia. I love all the fall flavors and spices and maple syrup reminds me of fall. I am not one of those people that goes to the store with a list. I have an idea in my head of what I need in the house, I look for what is fresh and available. Then when I get home I work my recipes off of that, rather than shopping for a recipe. I am not good at that and always forget ingredients. I like to keep lots of spices in my house, fresh herbs, and fresh ginger and garlic. With these items I can make any dish that much better. 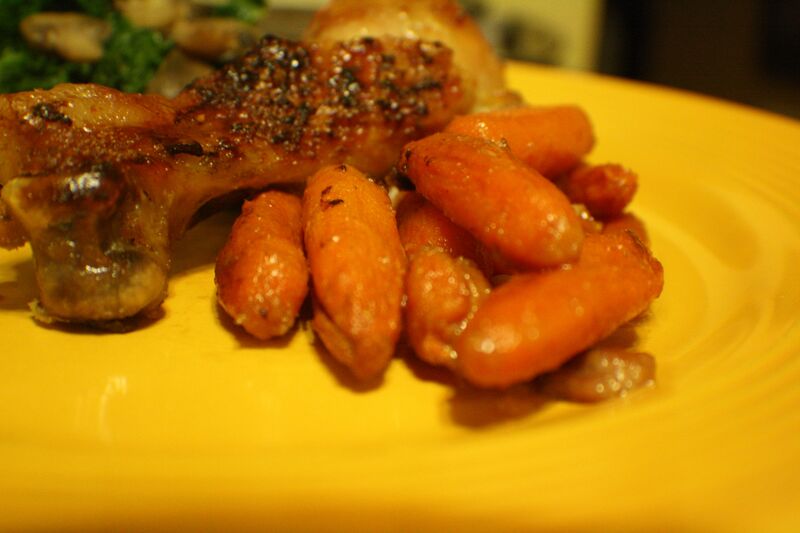 Tonight I decided I would make a maple glazed chicken with carrots. I braised some kale and mushrooms to go with it. I only buy chicken that is organic, or if that is not available, I buy chicken that has no hormones, antibiotics, or chemicals added. Even better if it is free range. I will write a post soon on why it is so important that we don’t ingest meat that has hormones in them. The dish came out wonderful. In keeping with my true self I accidentally omitted one of my ingredients. After I had lovingly minced all my garlic I forgot to put it in my marinade. It still came out delicious. What I discovered is that is great with or without the garlic, so if you don’t have any garlic on hand don’t worry, just leave it out. I used a whole chicken that was cut up into 2 large breasts and 4 drumsticks. You could use a whole chicken, or just wings, thighs, or breasts. In a ziploc bag place all your marinade ingredients. Add your chicken and seal the bag. Mix it all up in the bag, be sure to coat all the chicken. Place the bag in the fridge for at least 2 hours, you can do longer if you like. I took out a large baking dish and placed about half a bag of baby carrots on the bottom. I then placed the chicken on top. Cook at 375 degrees for roughly 1.5 hours or until done. The rule of thumb is usually 20 minutes per pound of meat. I opened the oven periodically and basted the chicken with the sauce at the bottom of the pan. In a pot or large saucepan heat a small amount of oil. Coconut or olive oil will be fine. Then I add the mushrooms and let them brown a bit, I add a bit of salt to help draw out their moisture. 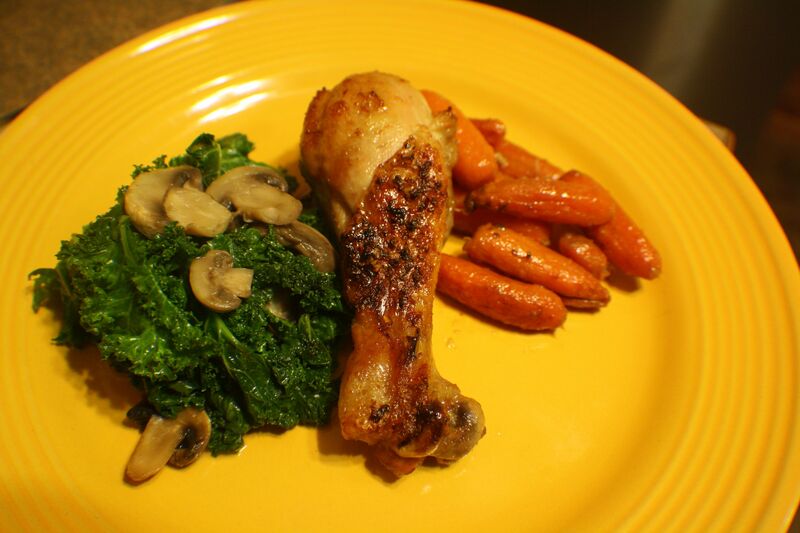 Then I add the kale, I just rip it up in my hands and add it in big chunks to the pan. I then add about 2 tbs of Bragg Liquid Aminos, 1/2 cup of chicken stock and a bit of salt. I let that cook just for a minute. 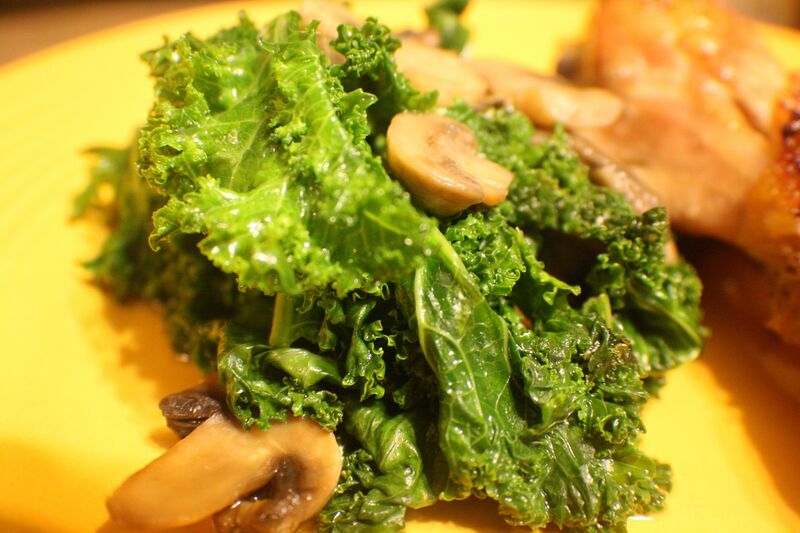 I like the kale to remain green, its cooked just enough to soften. All thats left to do is put this delicious food on a plate and eat. Both of my kids loved all the food, and both of my kids ate 2 servings of the greens. Yes, that is definitely a win.